i love my squier tele. i've never, however, liked the bridge. looking for a replacement that'll allow me to fit these brass saddles (that were kindly donated by a forum member). so i'm looking for a drop in (not through body) that'll sort it. any reasonably priced suggestions? mine has 4 securing screws (one at each corner)...the ones i've looked at quickly like that one don't seem right. not drilling through the body!! edit - actually 5 screws. there are 3 under the saddles and 2 at the neck end. humph. i fitted ferrules to my HB/ Thomann tele kit. badly lined up, TBH, but the through body + wilko bridge make it more "zingy" than before, but adds body and richness as well. just noticed (edited last post) that there are 5 screws in mine. not looking good. 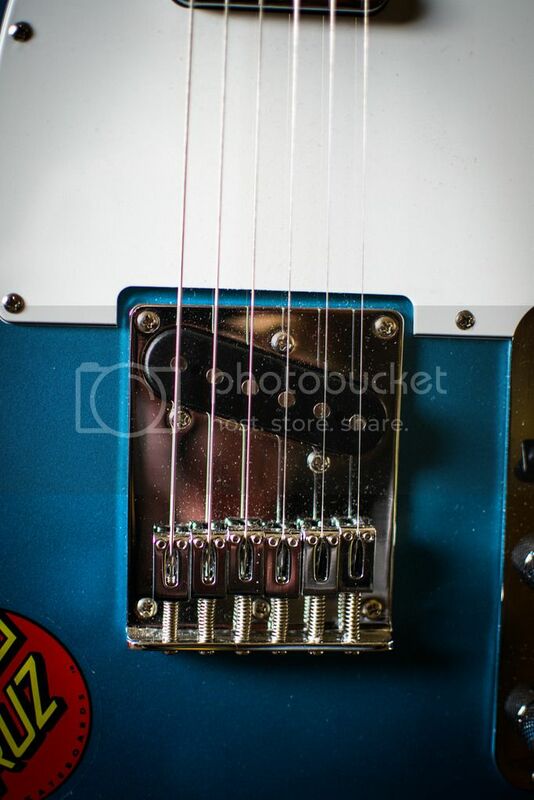 Would it be possible to remove the current saddles and then (carefully) drill holes into the bridge that's already on the guitar to allow you to fit screws/springs for the brass saddles??? if you saw what i did to my other tele when fitting the bigsby...i'm not highly accurate with power tools. do you have the year of manufacture of your tele? look, i never claimed to be John Cruz, alright?? That's actually a bloody good job johnniegoat! I'm impressed. I know the middle 2 holes are a tiny bit off but you nailed the distance in between the ferrules! thanks miss. it was/ is a mess, but it works and stays in tune. I was all set to link something cool, but those saddles killed it. i may have to drill. link away. those saddles aren't entirely necessary. 2. use a pen to mark where the new bridges other 3 attaching screw (by the springs) onto the body of your tele and drill those screw holes (carefully) into the body of your tele. By the looks of it the new bridge will cover the old bridge holes. Hopefully(!) you should then be able to install the bridge of your choice. Stumbled across this in YouTube. 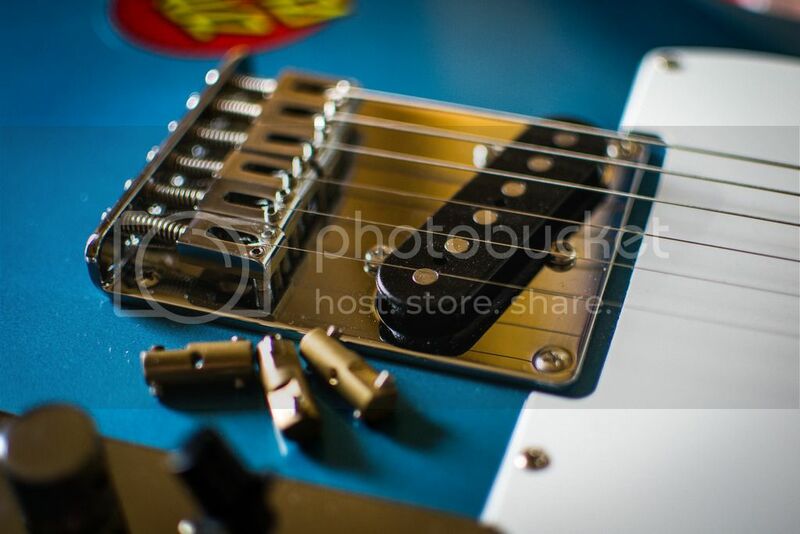 Shows you what it would look like to straight swap over to a traditional style bridge on a Squier Affinity tele. Looks pretty good IMO! And hole filling is usually easier/safer than hole drilling! If the link doesn't work, try popping "Install Ashtray bridge in Squier Affinity Telecaster" into the YT search box.